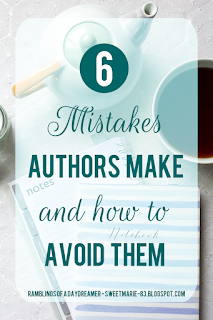 Having been a self-published author for almost six years and a book blogger for seven, I’ve seen a lot of mistakes and, naturally, made some myself. As a reader, an observer, and an author, it can be frustrating (and cringe-worthy) to see some of the things authors do, whether they’re traditionally published or self-published, newbies or seasoned authors. Read on to see if you’re making any of these mistakes, and how you can avoid them. You don’t have to live on social media and you don’t have to be present/active on all forms of social media, but you should have a presence of some sort. When I finish reading a book I loved, one of the first things I do is look up the author. I want to see what they’re up to, what they do when they’re not writing, and if we have things in common besides a love of stories. As a bookstagrammer, I also want to be able to tag them in photos of their books, if not on the original photo on Instagram, then at least on Twitter or Facebook. Many people want to tell authors they’re reading their books, loved their books, ask a question, or simply feel a connection of some sort. If you're averse to social media or feel it's too much of a time drain, try choosing one and dedicating a bit of time to it each week. Something that’s always driven me nuts as a book blogger is getting emails addressed to...well, not me. Dear blogger, Hello, Hi Ramblings of a Daydreamer. NO. My name is all over my blog, and I even mention in my review policy that if you can’t take the time to address me by name, I can’t take the time to read your book. Despite that, I still get impersonal emails...which get deleted without being read. Think about it: book bloggers dedicate hours of their time to reading, reviewing, and promoting books for free. You don’t have to be their best friend, but at the very least, even if you’re sending a form letter, insert their name. I’m currently accepting review books on a very limited basis, largely because I want to read more ‘me’ books, but when I get an email that not only addresses me by name but also adds something personal, I’m more likely to accept the book for review. I’ve had authors tell me they’re also from Canada, or they love Doctor Who, or they’re obsessed with London, which shows me they’ve taken the time to actually check out my blog and likely see if their book is a good fit for my tastes. Related to being impersonal is ignoring your readers/fans. Some authors must get a ton of messages on a daily basis and it would be nearly impossible to keep up, but it’s important to at least try to connect with people. Our success as authors is dependant on readers, so it only seems fair to acknowledge people and be grateful when they reach out. Answer emails, reply to tweets, like tagged pictures on Instagram - it only takes a moment of your time, but could mean the world to someone who admires you/your work. I’ve seen countless readers (myself included) say that authors are their rock stars/celebrities, so think how a reader who considers you a celebrity would feel if you took the time to reply to their tweet telling you how much they loved your latest book. We can probably all agree that whether in your personal or professional life, no one likes someone who talks about themselves constantly or brings everything back to them. As an author, this can mean tweeting about nothing but your book all day every day or promoting nothing but your own work on Facebook, Instagram, etc. Something that always makes me cringe (and this goes back to mistake #3, being spammy) is seeing an author inserting themselves into a conversation on Twitter for the sole purpose of promoting their book. I’ve had authors tweet me and tell me I should check out their book. I’ve seen authors tweet readers who are talking about a book they loved and say something like ‘Since you liked that, you’d love my book!’ If you’ve never spoken to someone before and you pop into their feed to pimp your book, that’s likely the fastest way to get them avoid your book. Even if you do it in a cute or clever way, it usually reeks of desperation and is a complete turn off. Unless someone is specifically asking for recommendations, don’t randomly accost them with your book. Self-promotion is a necessary evil in this business, especially if you’re self-published or published by a small press and don’t have a team of people doing promo for you. It can be difficult to find a balance, but it’s necessary if you want to avoid driving people away. If you’re not sure what else to post about, talk about books you love or books you’re excited about. Talk about your life. Share your own writing/publishing tips, or share articles you found useful. Retweet or share other authors’ posts about their books, writing tips and advice, etc. If you promise readers something and don’t follow through, some people will shrug it off, but others will lose interest in you and your books. One example of not following through is offering a freebie and not sending it. A lot of authors offer a freebie to people who sign up for their newsletter. This can be a fantastic way to build your mailing list, but make sure you follow through and send the freebie. Last year, I came across an author who was offering a free short story to newsletter subscribers; it was set in Ireland, and if you know me at all, you’ll know I’m obsessed with Ireland. I signed up, got a confirmation email saying the ebook would be on its way in the next few days, but if I didn’t receive it to email the author and let her know. I waited a few days, emailed the author, and never heard back from her. Sure, emails can get lost or go into junk mail, but never hearing back from that author and never getting the freebie (which I was excited about and would have read and reviewed immediately) made me lose interest in her work. Another example is having a giveaway and not sending the prize. I won a giveaway from an author in her Facebook group, and she never sent the prize. I decided I wouldn’t enter any more of her giveaways, but she had one of those ‘tag a friend and you’ll each win a book’ giveaways and a friend tagged me and won. Again, the author didn’t send the prize. This time I messaged her to check in; she said she’d forgotten and promised to send it that night, but she never did. I later found out from a couple of other readers that this was a habit of hers, which made me lose faith - and interest - in this author. 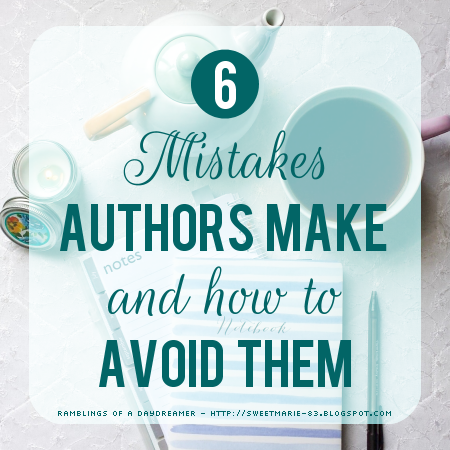 This is probably the worst mistake authors make. The other things are annoying, but few of them have the potential to ruin your career, unlike this one. Here's the thing: reading is subjective. Some people will love your book, some people will hate it, and others will fall somewhere in between or simply be indifferent. How a reader feels about your book is their opinion and they’re entitled to it. A common sentiment among authors is that reviews are for readers. While I understand the reasoning behind that, I’m on the fence about it. When I published my debut novel, Blue Sky Days, I read every single review I could find. The positive reviews had me soaring on cloud nine, while the negative ones hurt my heart and stuck with me. I learned a lot from those negative reviews, and I genuinely think what I learned made me a better writer, but those early days were rough. Something I never did, though, even if a reviewer eviscerated my book was to engage. I clicked like on the positive reviews, and thanked many of them for reading my book, but I never engaged with people who didn’t enjoy the book, because I knew they were entitled to their opinion. Now I tend to avoid reviews, unless someone sends one to me (my critique partner occasionally sends me positive reviews she’s found, which is a nice boost) because I know they can cause a downward spiral of self-doubt and misery, and who needs that? Whether you read reviews or not is up to you, but I can tell you right now, attacking a reviewer is a good way to lose a ton of readers, if not ruin your career. If you’re part of the book community on Twitter, I’m sure you've heard of at least one author who aggressively confronted or attacked a reader over a negative review, and it’s likely a safe bet to say you then avoided their books. In this business, as with any creative business, if you can’t develop a thick skin and realize not every book is for every person, you might want to rethink your career path. Great advice. Regarding number 2, there's been a few reviewer blogs I've looked around and could not find their name. Kinda drove me nuts because I knew addressing personal is a big thing when contacting book reviewers. I remember one I actually pointed it out and said I had looked and made it a little joke. I can't remember the blog, but I wonder if they fixed it. Thanks, Patty. And yes! Sometimes it's an oversight on the blogger's part. I've run into that, too - checked their blog posts, their about page, their social media, and they only went by a handle.